Events: Trading update for the year ending 30 June 2018 published 13 July 2018, director share sales published 16 July 2018 and shareholder open-day presentation hosted 17 July 2018. Summary: Earlier this week I attended TSTL’s third annual open day, and this year the event was accompanied by news of hefty director selling as well as confirmation of record revenue and profit. The chairman has reduced his shareholding from 19% to 15%, and confirmed he is looking to sell more during the next few years. The marquee presentation did not provide any great revelations, but one slide did show a useful sales comparison between the UK and overseas, while another slide suggested full-year sales of the group’s ‘core’ disinfectants had just advanced an impressive 18%. I continue to hold. This week I paid a third visit to an obscure Cambridgeshire village to complete a hat-trick of TSTL open-day attendances. Similar to the previous two events (2016 and 2017), the 2018 open day consisted of a management presentation/Q&A, a large sandwich buffet, the opportunity to tour the factory and a chance to inspect various products. 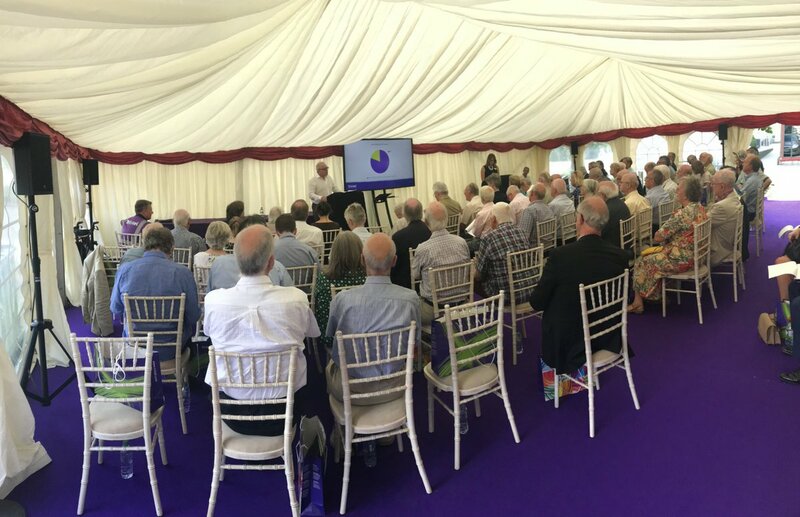 Once again the main presentation took place in a white marquee out in the car park, and this time the use of microphones vastly improved the acoustics. Staff wore the usual white carnations, attendees had to sit on last year’s awful chairs, and it was another warm day. I must applaud TSTL for arranging these open days. They are popular with investors — the photo above suggests approximately 50 people attended this year’s gathering — and more quoted companies ought to host similar events. The statement read very well, with revenue and profit hitting new records. Indeed, turnover of £22.2m is just shy of the £22.8m minimum TSTL had projected for 2019 back in October 2016. However, analysing the figures further did raise a few questions. It seems to me UK revenue gained 6% during the second half to produce a 1% gain for the full year. I have to say, the second-half performance was a pleasant surprise given the 4% UK sales drop witnessed during the first half. Full details about the UK performance will no doubt be revealed within October’s full-year results. I will be keen to discover how UK sales of the group’s ‘core’ medical-instrument disinfectants performed, and then compare that progress to that of TSTL’s ‘other’ veterinary, cleanroom and legacy products. I get the impression UK sales of the ‘core’ disinfectants may have done particularly well during the second half. One useful snippet from the open day concerned the forthcoming renewal of the firm’s framework agreement with the NHS. I was told TSTL had presented the health service with a revised UK pricing structure that implies low-to-mid-single-digit price rises for the next four years. Whether the NHS trusts all accept the higher pricing is of course another matter, but TSTL did claim it had effectively lifted prices every year within the UK (and overseas) to date. My earlier table shows H2 overseas revenue growing by ‘only’ 11%, which I thought was a little weak given the 28% advance during H1. Management comments at the open day suggested there had not been any problems, with Germany apparently expanding sales by 40% and Australia advancing sales by between 20% to 30% for the full year. The directors did say the Hong Kong operation had experienced lower revenue as the group took full control of what was a third-party distributor outfit. Full details about the overseas performance will no doubt be revealed within October’s full-year results. 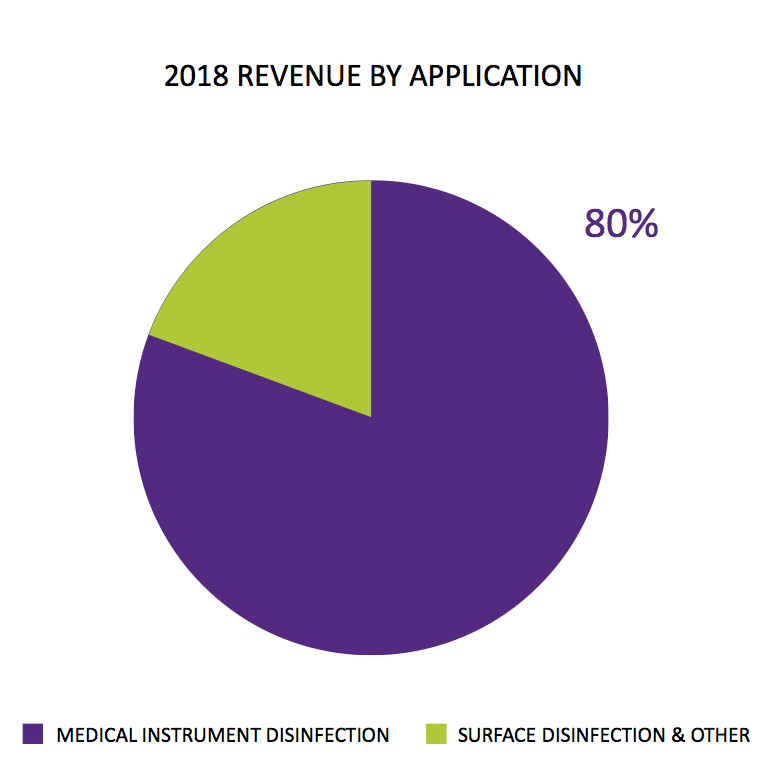 80% of £22.2m indicates ‘core’ medical-instrument disinfection products produced revenue of £17.8m during 2018. If I have interpreted the slide correctly, then it appears second-half revenue relating to ‘core’ medical-instrument disinfectants gained a very impressive 19% (versus 16% during the first half and 18% for the full year). 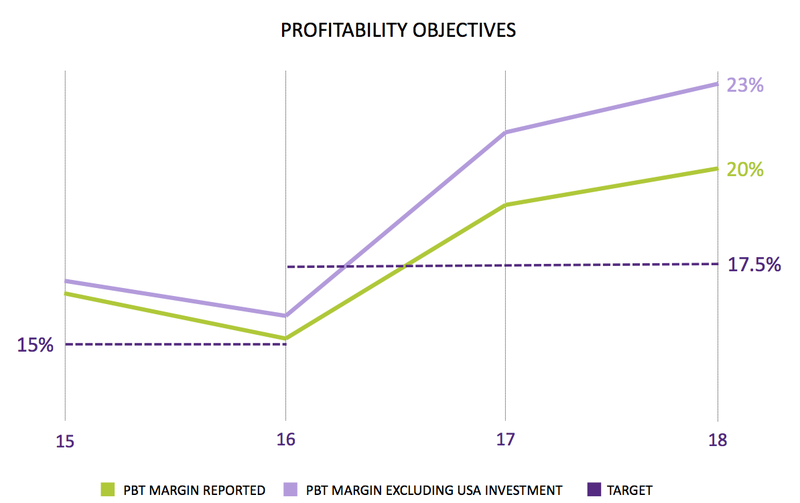 Full-year US regulatory costs were therefore c£660k, some way below the £800k TSTL had expected at the half year. I must admit, the result for H2 2018 coming in at less than H2 2017 seems disappointing. The likely explanation is the £200k used to pay off the (now former) Hong Kong distributor, which TSTL announced within the first-half results and confirmed was all expensed during H2. Also, past TSTL statements have always ‘sand bagged’ future profit projections, so “at least £4.4m” may in reality turn out to be £4.5m. October’s results will no doubt provide greater clarity for my sums. My calculations suggest the company enjoyed a cash-generative second half. February’s interim results showed a £4.9m cash balance, and adjusting for the £0.7m H1 dividend, the second half appears to have enjoyed a cash inflow of £2.4m or more (or approximately 5.5p per share). Cash in the bank is now equivalent to 15p per share. Someone in the marquee did ask if the company required extra cash to fund the expansion programme (answer: no). I guess at this point next year, with the cash pile perhaps heading towards £10m, the marquee questioning could return to the likelihood of another special dividend. In the meantime, I am hopeful TSTL can find an opportunity to purchase another foreign distributor. The Australian deal announced two years ago appears to have been a success and the director talk in the marquee confirmed company-owned subsidiaries were very much the preferred option overseas. An RNS issued the day before the shareholder presentation may have dampened the marquee mood slightly. The statement revealed significant share sales at 285p from three directors. Notably, non-exec chairman Francisco Soler sold 21% of his holding to raise almost £5m (Mr Soler retains a 15%/£20m stake). In addition, chief exec Paul Swinney raised £1.4m by exercising 30% of his options, while non-exec Paul Barnes raised £600k by selling 36% of his ordinary shareholding. I must admit, the orchestrated selling does not look great — especially given the upbeat open-day presentation and the business (finally) having achieved its first US regulatory approval. That said, the same directors made similar hefty share sales during April 2017 at 175p — and the share price has since rallied 63%. So the omens may not be so sinister. Mr Soler announced in the marquee that he would continue to reduce his shareholding in an “orderly manner” during “the next couple of years”. I asked Mr Soler afterwards why he was selling out when the group was doing so well and on the cusp on breaking into the States. He said that he had been seriously ill and, at 73 years old, now was the time to retire and offload his shares. For what it is worth, I got the distinct impression Mr Soler would prefer a decent bid for the rest of his shares instead of awaiting an even higher share price based on the company’s longer-term performance. The marquee grapevine suggested other director selling could be due to divorce matters. Having attended the two previous open days and maybe eight or so other results presentations, I did not arrive at this open day armed with that many questions. In fact, I confess I spent most of the open day talking to other shareholders rather than TSTL’s staff. I do hope investment complacency is not setting in. I can report that the marquee Q&A session did not provide any great revelations. A question about patents elicited confirmation of 250 or so granted patents worldwide and seven patent ‘families’ (one for foams, one for wipes, and so on), which all provide a “broad patent thicket” as a defence against rivals. For the flagship wipes product, patent expiries start from 2024 while other products may not see their patents expire until the mid 2030s. Management also confirmed the US timetables remain unchanged. State-by-state registrations following the EPA approval should all be completed by the end of December. The first five states for registration are Florida, North Carolina, Illinois, New Jersey and Arizona — TSTL has been told these states offer the easiest paperwork. A submission to the FDA is still expected to be made before the end of December. Management said the submission would be followed by a “six-month review process”. The directors were somewhat cautious about the early Stateside potential. The first US revenues will be “very modest” and will “gradually build up over time”. “We will take our time to build a business in the USA” appeared to be the main message. I should add that Parker Laboratories is apparently “very excited” to be collaborating with TSTL in the States. Shareholders were told that Parker makes its own disinfectants to clean the ultrasound probes on which its ultrasound gels are applied. I can only presume TSTL’s foams are more effective than Parker’s own disinfectants. The Q&A confirmed Parker will manufacture TSTL’s ‘Duo’ foam, but will sell only to ultrasound customers. Sales will be made via Parker’s national sales team. The numbers show the average UK hospital spends approximately £9k on TSTL’s wipes and foams annually, versus less than £2k by the average German and Australian hospital. Management invited shareholders to use the UK as a benchmark to extrapolate how the German and Australian operations could grow. TSTL’s share-price rating remains lofty. …I arrive at an underlying pre-tax profit of at least £4.9m. Applying the standard 19% UK tax rate gives earnings of £4.0m or 9.1p per share. After subtracting the latest 15p per share cash position from the 300p share price, my underlying P/E comes to 285p/9.1p = 31. Certainly TSTL’s management and the marquee attendees I met seemed confident about TSTL succeeding in the States, and I do believe the company will (eventually!) obtain all of the necessary EPA/FDA approvals and state registrations. That said, I get the impression notable US revenue — let alone notable US profit — may still be many years away. Nevertheless, I am impressed how sales of the ‘core’ medical-instrument disinfectants — which already represent 80% of total revenue — advanced by 18% during 2018 (assuming my sums are right). I am also hopeful that TSTL’s existing overseas operations, particularly Germany and Australia, still offer significant potential. And I would like to think the new in-house Hong Kong subsidiary can make a better job of selling into China than the previous distributor. So, all told, perhaps there is more to the present elevated rating than simply wild optimism about the US. This entry was posted in My Shares, Tristel and tagged Tristel, TSTL on July 20, 2018 by Maynard Paton. – the numbers of hospitals in each country may be a bit of a distraction. I wonder if definitions vary? 672 hospitals in the UK strikes me as surprisingly few. Maybe better to look at the relative populations in UK / Oz / Germany? – Yes, there is everything to play for in China. But also a major IP risk, I’d have thought given that the basic chemistry of their products is pretty basic. I continue to hold a decent position – but for investment spread rather than deep conviction at the current price. Hi Maynard, Super Analysis – thanks. Keep planning to make an open day but work gets in the way. 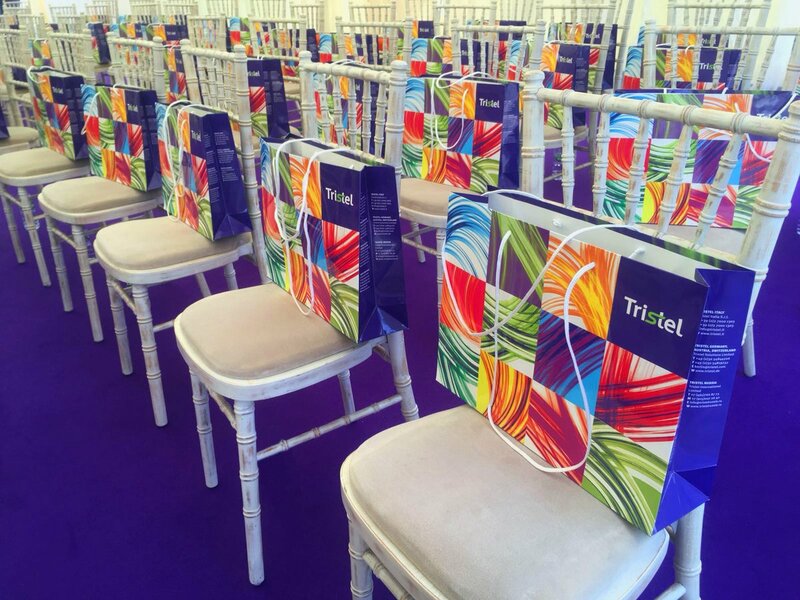 Tristel is far and away my largest shareholding – and I currently have a negative in price! This makes me a bolder investor in the company that I might otherwise be. Whilst I think the PE is lofty I think the medium long-term growth projections look good (ref your points about Oz and Germany in the short-term etc.). and it is close to being justified. One thing I think may happen is somebody big will offer to buy them – particularly if the US looks like it is definitely going to deliver. Any views on this – wonder if the Parkers move was to counter a threat? Hi Maynard, Very keen to hear your view and stance on the latest results and share drop. Maybe investors have (over?) reacted to the share incentive scheme. This is a one off and the US is not delivering revenue yet but it will. But I recall sensitivity to the reward system in the past. I will write something. But half-term and SharePad articles mean it could be a week or two. I was critical how management handled the first option scheme, and the latest scheme has been handled much better. Something to consider is that the latest management options won’t vest unless the share price hits a certain price, and the share price — unlike EPS, ROE etc — can’t be fudged. So management may not receive the latest options, although the accounting rules require some sort of charge to be applied to the accounts. I attended one of the results presentations on Thursday and the latest FDA submission delay was caused — at least to me — by some management/consultant bungling. Not great, but the US potential remains and there were some encouraging snippets provided at the event. “For the flagship wipes product, patent expiries start from 2024 while other products may not see their patents expire until the mid 2030s. I have followed up on this subject. Apparently the patents are supported by ‘secret ingredients’ within the chlorine-dioxide formulation. These ingredients are ‘accelerators’, which help the other chemicals mix in a short space of time for hospital use. Importantly, these ‘accelerators’ disappear during the mixing reaction — so it is very difficult for anyone to reverse engineer the chemistry in a lab. TSTL’s chemical formula is not patented and just a few individuals know the ingredients involved. The ingredients are not accessible though public databases (e.g. the FDA etc).